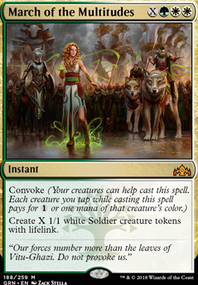 - Nykthos, Shrine to Nyx - I wouldn't normally consider this for a deck that's not mono-color, it requires you effectively have a devotion of at least four in one color to have value. In many environments there's enough removal flying this might not happen very often (5-6 boardwipes/deck for example) in a slower environment you might get away with it more. 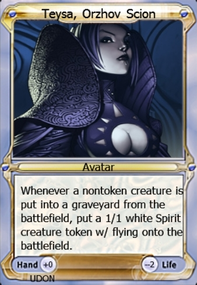 - Vault of the Archangel - This might be fine, I'd be wary of putting too many lands that tap for colorless though, I'd consider this low priority as it typically benefits decks focused on victory through attacking more. - Westvale Abbey Flip - This fun if you have a cleric subtheme you're sure about. 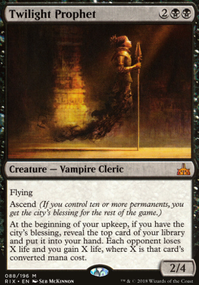 It is tough to generate the clerics you need off its ability that effectively costs 6 mana each turn, though. 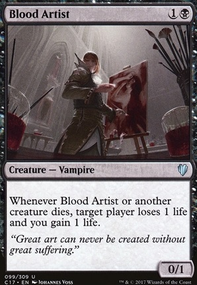 - Exquisite Blood - This is part of a very common two-card combo that many newer players attempt. If you play this, even without the other one, expect to draw disproportionate hostility. If you're doing the combo, try to drop both at the same time to minimize the chance anyone has to respond. - Athreos, God of Passage - This is a potentially very strong card, you might be able to make some use of it, but it is damn expensive... same with Diabolic Tutor . That's just my opinions of your maybeboard. Any I didn't mention I have no opinion or not enough experience using/fighting to comment. Cards like Conviction , Flickering Ward , Cage of Hands , and Forced Worship are sometimes cool ways to generate extra experience counters. Ghostly Prison and Sphere of Safety are popular ways to keep your opponents from attacking you (although I think Ghostly Prison might be a little less budget-friendly). 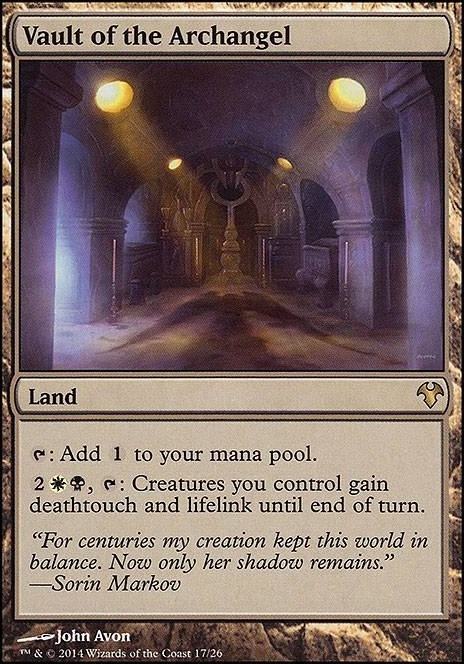 Vault of the Archangel is a good utility land, since life gain is a good way to keep yourself alive during a long game.